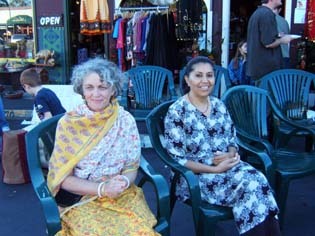 All Glories to Srila Govinda Maharaja's auspicious visit to the Soquel Seva Ashram. May we always have his divine blessings as long as we live. This morning Srila Gurudev gave a vivacious darshan. He made many jokes and spoke about his health. He said he wishes to stay in Soquel as long as possible and that he is thinking he may go to Venezuela and Mexico. After one hour of darshan, I asked His Divine Grace, "Gurudev, we will be having a preaching program and would like to ask for your blessings." He radiated an enormous smile and responded, "Yes, Krishna gives you his blessings and you have my blessings." That was my fuel for the rest of the day. We were given the opportunity to chant and distribute books at a Middle Eastern dance party, which was held at a store called Masala Imports. After the dancers performed, we took the stage and chanted for about one hour. 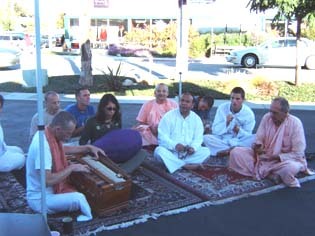 Rajaram Prabhu lead some of the bhajans, Kamal Krishna Prabhu played the karatals. 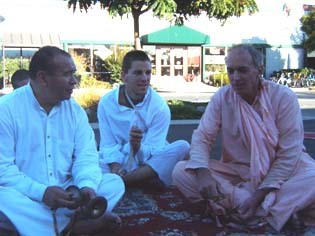 Siddhanti Maharaj and Parvat Maharaj also sang. 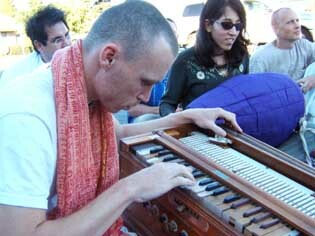 Krishna Sundar Prabhu lead many bhajans and played the harmonium. Vrindavaneshvari Didi played the mrdanga, and Tamal Bharan Krishna Prabhu sang along. Jaganath Swami Prabhu honored us with his presence. Sri Lekha Didi and Revati Didi sat near the audience and sang along. 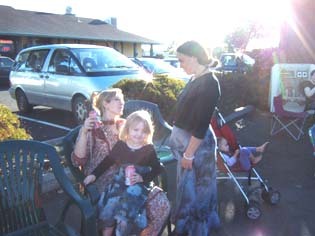 Sita Didi, Narayani Didi and their beautiful children added warmth to our sankirtan group. 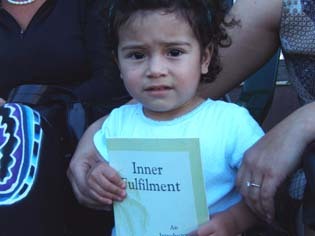 After we chanted for about a half hour, I distributed books and invitations to our Ashram among the audience members. Many were very friendly and seemed interested. This young lady had the fortune of taking home a book written by Srila Sridhar Maharaj. I remember hearing that devotional books are like time bombs. Maybe when she grows up it will take effect. 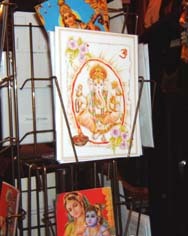 Inside the store there are many pictures of Lord Krishna, Ganesh, Lord Siva, Laksmi Devi, as well as a few Sri Chaitanya Saraswat Math books in the display case. 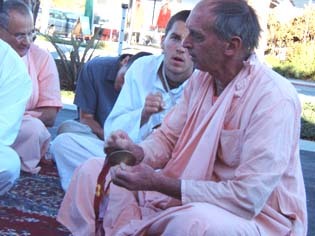 People are more aware of Hinduism and are attracted to Indian culture. This gives us a chance to bring new people to the temple. The wonderful lady who made this happen: Naomi. 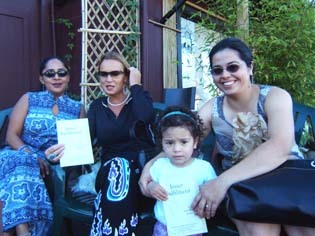 She and her husband were kind enough to let us participate in this event. Jay Nitai Gaur Haribol! Note from the Editor: Vaidehi Didi single-handedly organized this preaching program, quite an impressive task for an 18-year-old. She charmed everyone with her bright smile and enthusiasm. 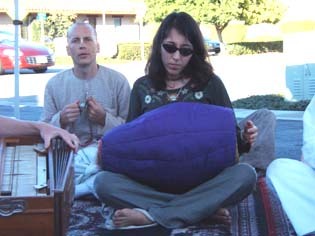 She even led some of the kirtan with a strong voice. Her service attitude for so many different jobs (taking photos, writing reports, preaching, cleaning, going for collections, to name a few) is always inspiring.